Autumn it feels is just round the corner, though, it seems the weather has other ideas. I can't remember a time when the weather was really this glorious when we're leaving September and heading towards October. I didn't expect the weather to be so wonderful yesterday and headed out in a coat - which ended up being swapped for a cardigan. 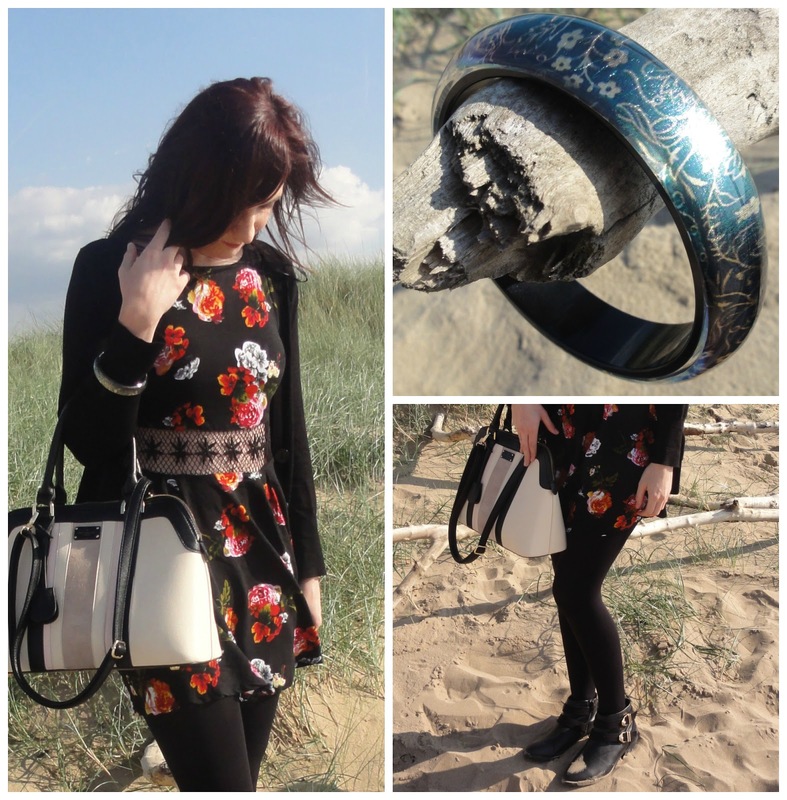 I did, however, mix it up with various Summer/Autumn styles; Tights, boots, dress with cut out, flowers prints in Autumn shades. This dress is AX Paris however I got my hands on it about two years ago, only wore it twice and thought it was the perfect Pre-Autumn dress. I will, however, find some similar, sort of - here, here and here. 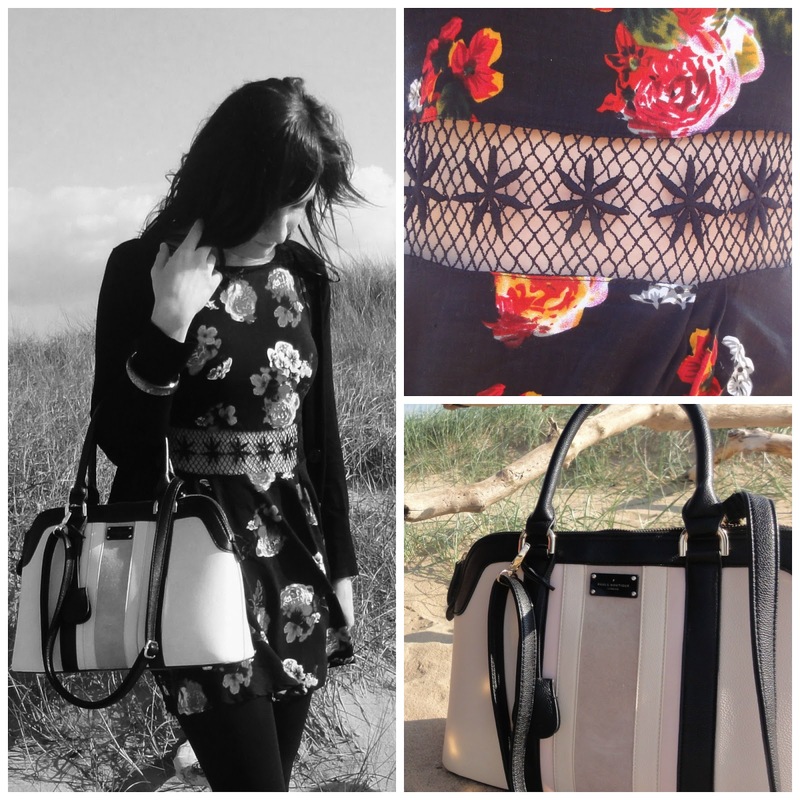 My bag is from Paul Boutique and is from the SS/14 range. I love the pastel, ice cream shades and size. I believe mine was limited edition for SS/14, thankfully, it's the much loved best selling Maisy bag and is available in a variety of shades for just £65.00 - here. 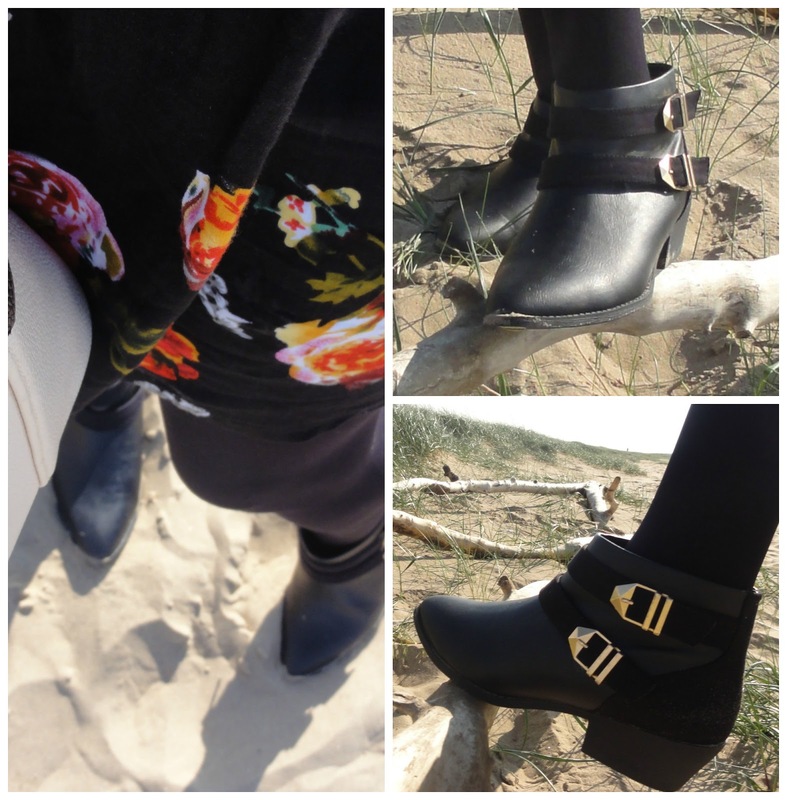 My ankle boots are from New Look and part of the AW/14 collection. I really love New Look for shoes, they are such good value and look great, and probably one of the reasons they always win Lorraine Kelly' award for best shoes. The boots I chose this year are the double buckle pointed ankle boots with a mini heel. These honestly are the most comfiest shoes I've had in so long and available in sizes 3-9, and also in grey. They go with anything, skinny jeans or a dress. £24.99 here. Tights & Cardigan (old stock) are from George. In case you're interested the coat I set off in is also from New Look and available to purchase here for £44.99. It's a gorgeous Khaki fut trim hooded parka style coat. Definitely not something I would of picked up this time last year but fashion is about taking risks and I'm definitely being more daring with prints and so on. I kept accessories to a minimum and accessorized with this one bangle. This is a gorgeous duck egg shade and the added gold floral print is quite striking from the East collection. It's a great Autumn/Winter piece and really reminds me of Christmas. 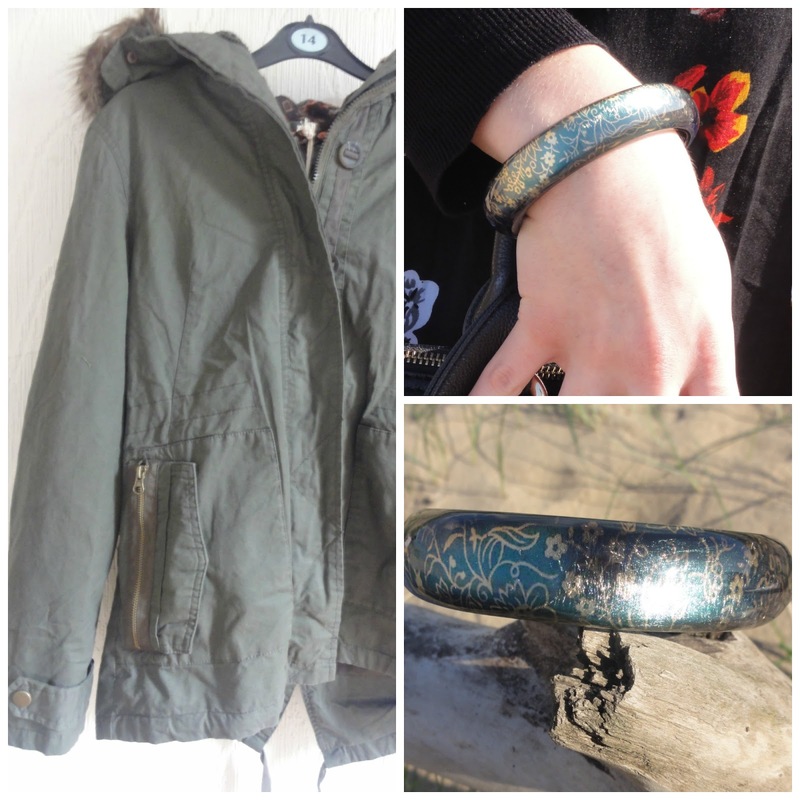 This bangle is a bargain £10.00 and available to Purchase from House of Frazer here. 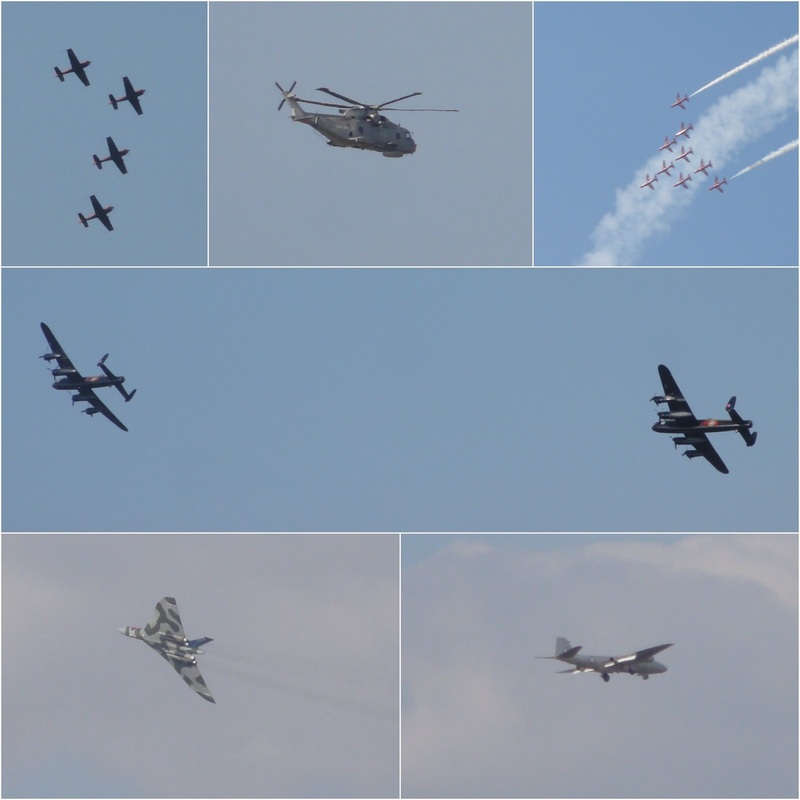 My trip was out to the annual Southport air show. The parking was ridiculous, the traffic was horrendous and was complete manic compared to other years, what should of been an hours journey was 4. I've heard some not so great things about the parking attendants not really having a care in the world, which, explains the traffic being crazy. We set off at 9.30 and were still waiting to get in at 2, due to the price we decided to give it a miss and got some late dinner/lunch before making our way to the beach and enjoying the rest of the show, for free. All in all it wasn't a day completely wasted and we hope to go again next year, hopefully things are a little different with more order, and help, next year. Below are some of the planes that I captured. This is a beautiful outfit, your dress is lovely, it's a shame it's not available anymore. And I love the booties!